…and I still feel the same as I did yesterday. Heck, I still feel the same as I did at forty, except for this little pain in my knee! I’d like to wax philosophic about turning fifty, but I haven’t had my second cup of coffee yet, and I’m still feeling the room tip from yesterday’s sailing excursion. All I can say is that I’m so glad I chose this way to turn fifty. Being in the life-affirming presence of my girlfriends has been like visiting the fountain of youth. Their perspective is helping me look forward to my fifties with anticipation and excitement. Ten years ago today, on my fortieth birthday, Harrah and Sandy threw me a lingerie shower. It was two months before my wedding, though I still didn’t have an engagement ring. I was sitting on the sofa in their living room surrounded by happy cheering women, opening packages of sweet little nothings…. when the front door opened and in walked Steve. He stepped through the women who were sitting on the floor, knelt down on one knee, and handed me a little box. 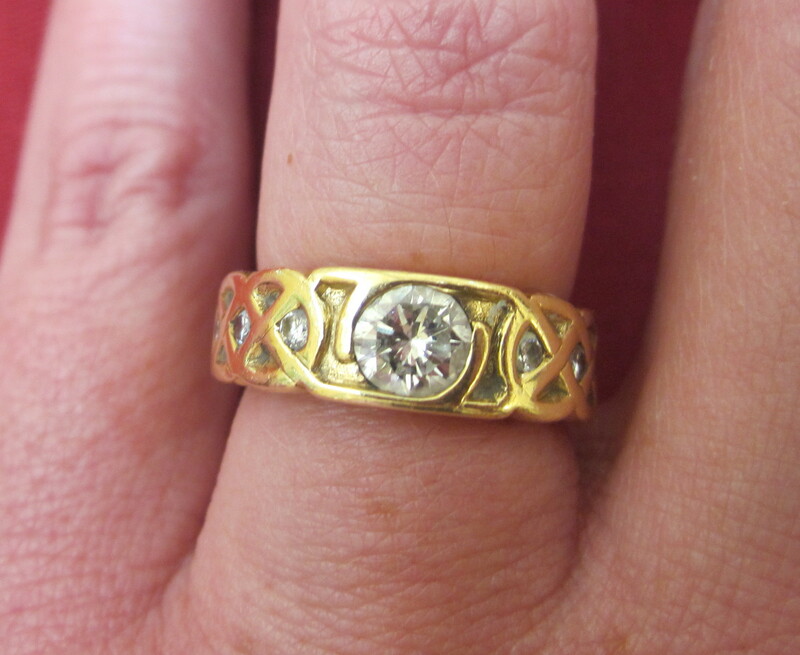 I opened it and there was this beautiful gold ring, with diamonds locked inside Celtic knots. Harrah had helped him design it. He asked me to marry him again. I cried and said yes (of course), and he put the ring on my finger. It’s early Thursday morning in Maine. The plan is for a relaxing day at home followed by dinner at Shephard’s Pie in Rockport with Harrah and a few of my new friends. Early tomorrow morning, Harrah’s friend John will drive me to Portland. From there I’ll take the bus to Boston. From there I’ll fly to Alexandria, Louisiana, to meet my final friend on this journey, Sandy Barger Bryant. The final event of my forties was to go out into Rockport Harbor with Molly and Harrah in Molly’s sailboat. Late afternoon going into sunset. Oh lovely. Enjoy the pics. Molly is great fun and was very generous with her sailboat and her expert sailing skills. She turned fifty last year, and enjoyed helping me celebrate my fiftieth. Isn’t it amazing how easily women can just enter right into conversation – especially about relationships? First it was Harrah’s turn to share about her current venture into romance. Then Molly shared her story. Then it was my turn – talking about how Steve and I met, our crazy long (five-year) courtship, no friendship, ok courtship, no friendship, well all right I like you courtship, no wait I didn’t mean it friendship, ok it’s all off friendship, wow I actually love YOU and want to spend the rest of my life with you if you’ll still have me courtship, engagement, and marriage (finally) ten years ago. Sharing our stories – in between sailing instructions like “pull in the jib,” “helms alee,” “turn her about,” “trim the sails,” etc…. Make your own list (you know… THE list). But don’t make it until you’ve taken the time to know and love yourself. That way your list truly reflects who you are and what you value – not what others expect you to value. Consider the order of priorities on your list. What are the absolute deal breakers? What’s negotiable? Have really clear boundaries – and honor them. Don’t be surprised at the baggage that shows up in you and your potential partner from previous relationships. Do yourself and them a favor and carry it yourself, i.e. do what you can to get rid of it. Don’t expect your partner to carry your baggage. A good relationship can be very healing IF you stay conscious and responsible for your own wounds. Thank you, Molly, for sharing your lovely boat Ripple and your delightful company with us. One of MY favorite birthday’s was in Harrah’s Hobbit House with you, Linda and Harrah. Just the four of us. You’re celebrating with [one of] the best! Ah yes. I guess I’m special every day. These were special plates, however. Notice the cat under the egg & toast? Sandy gave these plates to Harrah to commemorate our Booger. How much more special can we get? I remember your little birthday in Harrah’s Hobbit House. I still miss that house. That was a sweet, intimate, very special time. 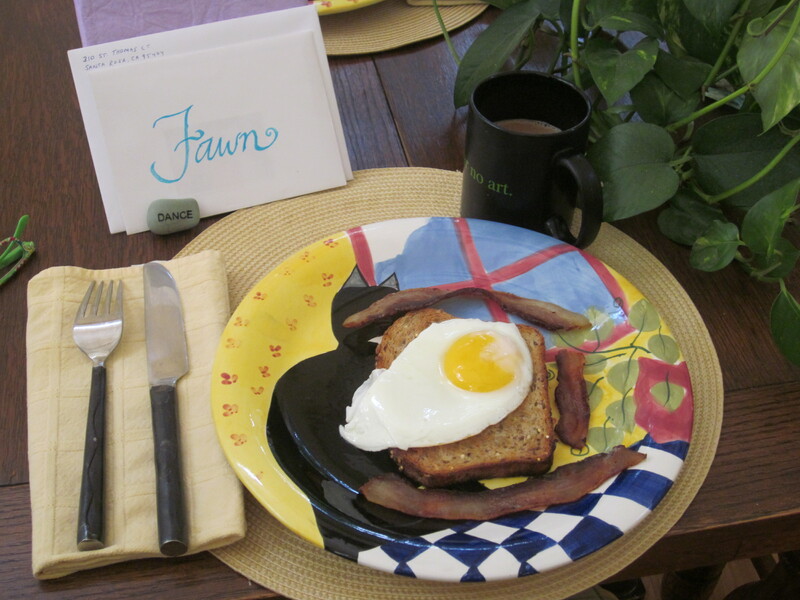 Happy Happy Birthday Fawn. From the whole Edwards’ family. Thank you Valerie, Lawrence, Isaac, and Samara. So grateful for you all. found that cat! Been thinking of you all day…..Happy Happy 50th Birthday. Glad we were able to be together as you were making this wonderful trip and we (Lawrence & me too) feel like we are part of your celebration. Be well and have many many more Happy, Healthy Birthdays!! What fun. Got your birthday duet on my cell phone. Wish I could publish that! You harmonized and all. So fun. So lovely. Thanks for all your love.